It was one sunny day when I took this outfit photos. However, that does not keep me from wearing a beanie and turtle neck top. 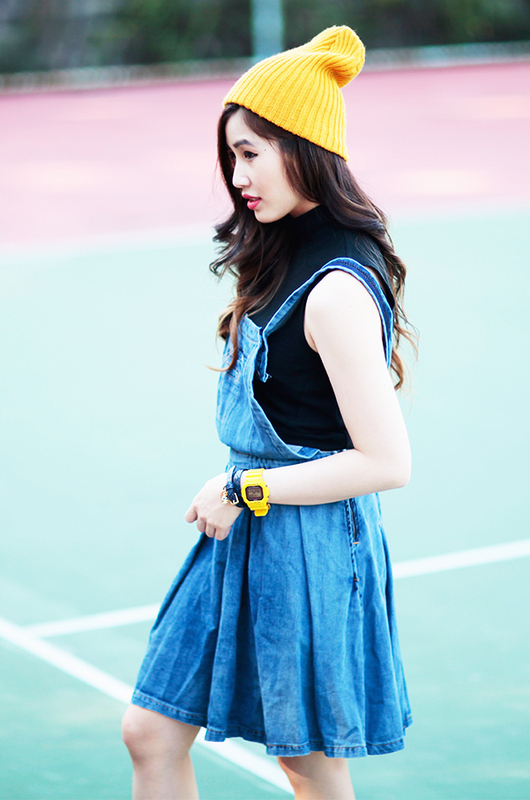 Being slightly playful, I was wearing skirt dungaree over my black turtle neck top with yellow colour as the highlight colour in this outfit. I have been wearing my Kenzo sneakers a lot lately. Besides that the shoes are really comfy, the colour makes it easier to match with my clothes. Sometimes I miss wearing my black and white converse though! Love your outfit!!! You are so pretty! Love your dungaree. The length is just so perfect. Your pictures are simply amazing.